Ergonomic seating is selected for comfort, versatility, durability and appearance. EC-2801: 5-legged polished aluminum base, adjustable foot ring, casters, seat height 21" to 28-1/2". Adjustable back. Vinyl or fabric choices available. EC-2801-AR: Arm rest for the EC-2801 or EC-2801-DH. Loop style. EC-2801-DH: Desk height chair, same as EC-2801 except seat height and this chair does not have a foot ring. EC-2801-ESD: Same as EC-2801 except ESD drag chain design, conductive casters and fabric or vinyl choices. TC-2103: Bench height chair, "flat" 5-star base, adjustable foot ring, dual wheel carpet casters, seat height 22" to 32", adjustable back, vinyl or fabric choices available. 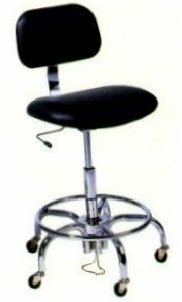 TC-2203-ESD: 5-legged tubular chrome base with footrest, conductive casters, drag chain design, seat height 23" to 28", adjustable back, black conductive vinyl or other colors and fabrics available. 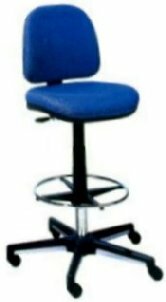 TC-2300-ESD: 5-legged polished cast aluminum base, conductive casters, foot loop, drag chain design, seat height 23-3/4" to 28-3/4", adjustable back, conductive vinyl or fabric choices available. PLEASE CALL 1-800-225-3532 for information and more options.